David Cameron: "We want a strong and stable eurozone"
The UK will not agree to hand any more powers to Brussels, David Cameron has told German leader Angela Merkel. After talks in Berlin, the prime minister said there was "no question" of him backing any treaty giving the EU more powers to shore up the eurozone. 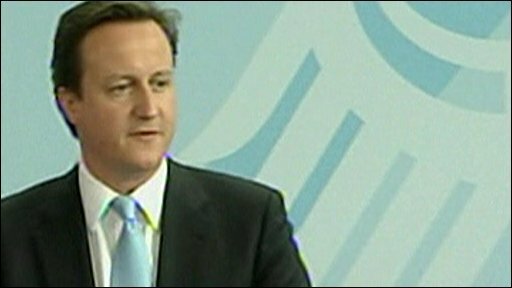 Amid efforts to contain Europe's debt crisis, Mr Cameron said he would not be "drawn into" bolstering the euro. But he stressed he wanted to play a positive role in Europe and a strong eurozone was in the UK's own interest. On the second leg of his first European trip since becoming prime minister, Mr Cameron said he wanted a "strong and positive partnership" with Germany. Mr Cameron's talks with Mrs Merkel in Berlin followed his meeting French President Nicolas Sarkozy on Thursday. The trip is taking place against a backdrop of financial turmoil across Europe and calls for tighter regulation of markets to support the troubled euro - which the UK has ruled out joining. At a press conference in the German capital, Mr Cameron said the UK would not agree to the transfer of any sovereignty from Westminster to Brussels as part of any future reforms to EU institutions aimed at protecting the single currency area from economic instability. Such a treaty was "not likely to happen" in the foreseeable future, Mr Cameron acknowledged. The Conservative leader has said any such transfer of powers would have to be approved by the British people in a referendum and has talked of repatriating EU powers in certain areas to the UK Parliament. "I want Britain to be a positive player in Europe," Mr Cameron told reporters. "I want us to work together to achieve the economic stability, growth and action on European deficits we know is very much in the interest of all our countries and in the interests of a strong, stable economy which we very clearly need. "Britain is not a member of the euro, nor are we likely to become a member, but we want a strong and stable eurozone. That is where 50% of our trade goes and it's our interest that that takes place." But he insisted: "Britain would not be agreeing to any agreement or treaty that drew us further into supporting the euro area. It goes without saying that any treaty, even one that just applied to the euro area, needs unanimous agreement of all 27 EU states including the UK, which of course has a veto." European finance ministers, including UK Chancellor George Osborne, are meeting in Brussels to try and reassure the financial markets after the euro fell to a four-year low against the dollar and stock markets fell across Europe on continuing economic concerns. On Friday, Germany's lower house of parliament approved its contribution to a £651bn rescue deal for the eurozone, battered by Greece's bailout and concerns about the debt situation in Portugal and Spain. The new UK government has made cutting its own record peacetime deficit a priority and will announce the details of £6bn of spending in initial cuts on Monday. After meeting the new prime minister, Mrs Merkel said there was a "lot of common ground" between the two countries on key issues and she hoped for a "friendly relationship" between the two. The two leaders also discussed the situation in Afghanistan - where both British and German troops are stationed - and the prospect of further sanctions against Iran. After it emerged that UK troops in southern Afghanistan would come under the operational command of their US allies for the first time, Mr Cameron said this made "good sense" and the UK was still committed to its role there. Mr Cameron and Mrs Merkel, who both head coalition governments, joked that they had discussed the secrets of making such an arrangement work. The BBC's Berlin correspondent Steve Rosenberg said while they agreed on some issues it was clear that there were real differences between the two countries over Europe and financial regulation.